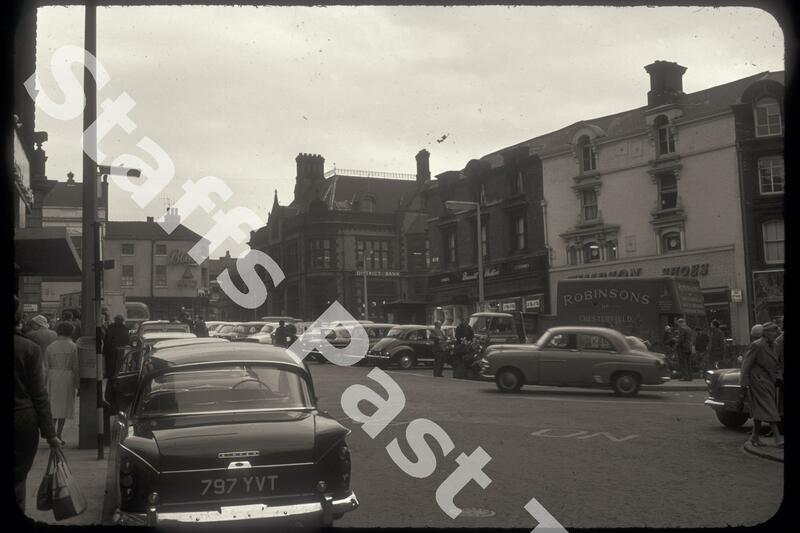 Description:The view of Market Square from Lamb Street, with Town Road at the top. The Bass public house on Town Road is The Grapes which was next door to The Angel. Demolished in the 1970s it became a car accessory shop and alter converted to a bank. Huntbach Street runs between the Grapes and the District Bank building. The District Bank was absorbed into the Nat West Bank in 1970. This late 19th Century building has been replaced with a modern Nat West Bank building and shops. On the right are Barnett Hulton, selling ladies costumes, and Timpson's shoe shop. On the front of the Robinsons of Chesterfield van it reads "surgical dressings and cardboard boxes": an unlikely combination, but the company is still producing this mix of products. The photograph was taken from the entrance to Hanley Public Market, now part of the Potteries Shopping Centre, when Market Square was still open to traffic and used for parking.